I personally love the look of rocks in a landscape. There is something very majestic and tranquil about rocks and there is a history and a story behind every single pebble and stone. Rocks have been in the landscape for millions of years and one can only speculate the amazing adventures and incredible stories they could tell if only they could speak. I grew up in Illinois and spent many summer days at my Grandpa and Grandma LaPaso’s lake house on the Kankakee river. I lived right behind a quarry filled by a natural spring and I must have skipped a thousand stones and collected about as many along the way. I loved the uniqueness of each and every rock and I wondered in their creation. I am an admitted Rockaholic. When I became a landscape designer it was for the love of flowers, but rocks are a huge part of my final creations. They can be incredibly functional and the best part of using river rocks and stepping-stones is that they become a permanent fixture that unlike plants and mulch, never have to be replaced. That being said…while they are a permanent fixture much like plants and mulch, they do require maintenance. Yikes! Someone underestimated the amount of work that goes into having rock in the nuisance strip! I hope you can see the abundant weeds in the photo above because this fellow has definitely allowed his weeds to take over this space. This happened because he used landscape fabric (or no liner at all) instead of plastic liner and because he does not pull the weeds as they come in. This space is about a year old and this is how his looks, the one below is 8 years old and maintained properly. River rock is for NO WATER, NOT for NO MAINTENANCE. This is a great solution for a walk way to your house from the driveway. 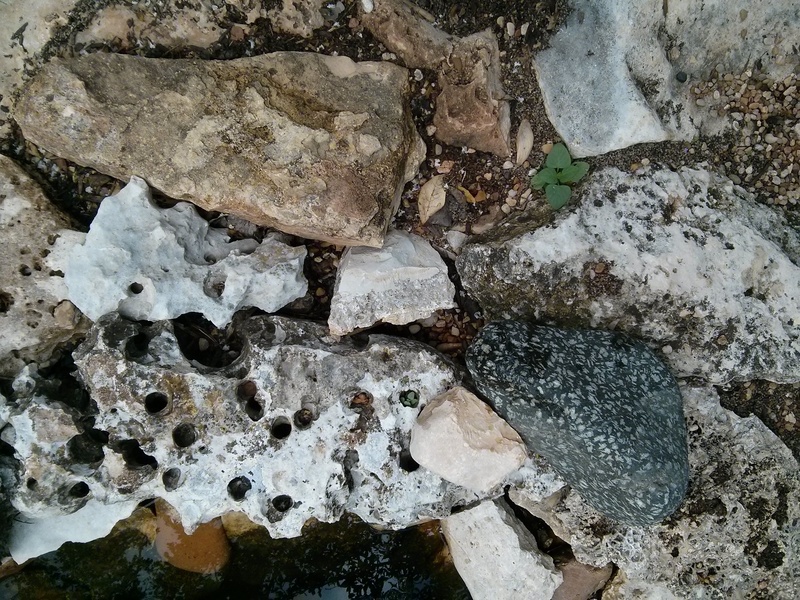 This is another great use for river rock…Remember though that anywhere you add rock will also add heat. Rock will increase the temperature of the area it is in so be careful where you place it. 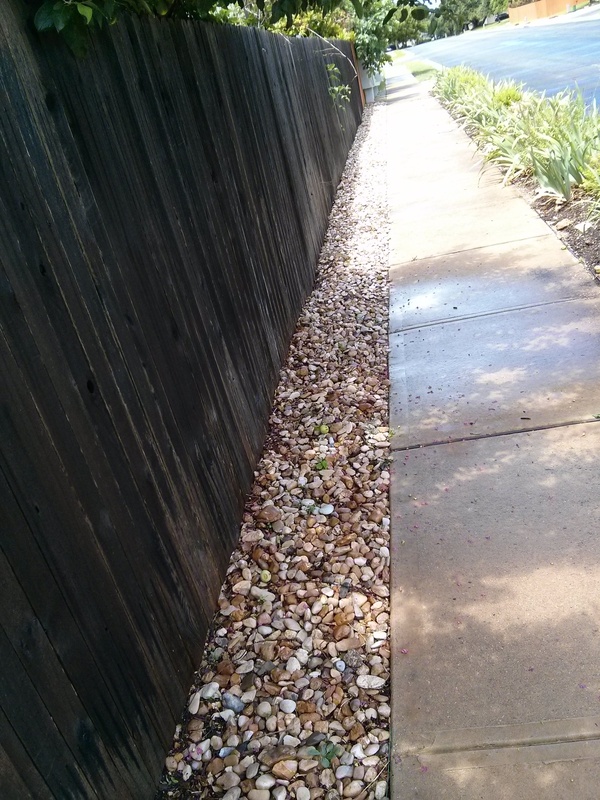 That weird strip between your fence and your sidewalk is a great place for rocks. If you decide to go with river rock, You will need to pull the weeds as they come in and be sure to never allow weeds to go to seed (flower) or the problem will only get worse. You will notice a growth usually after a rain and in the spring time. You can buy organic weed killer at the local nursery or big box stores and you can make a homemade remedy by mixing 20% acid vinegar (available at Lowe’s on 620) in a one gallon sprayer with 2 tbsp Epsom Salt and a tbsp of dish detergent. Shake and spray! 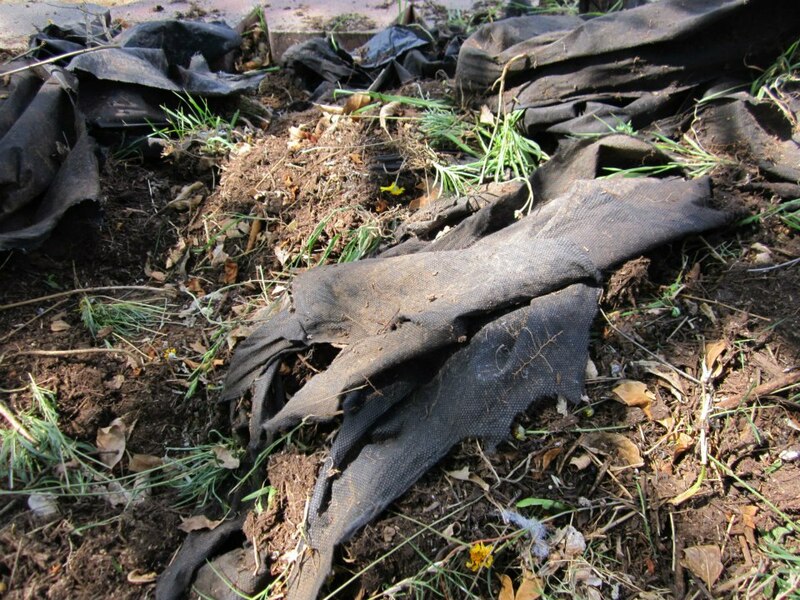 I greatly prefer plastic over fabric for small areas like the nuisance strip or fence line as the heat and rock combo the fabric will only last a couple of years before it begins to tear. That being said, if you are on a grade or slope, you will need to use fabric instead. Weed fabric after a few years in the shade…Certainly not going to hold up under rock and people. 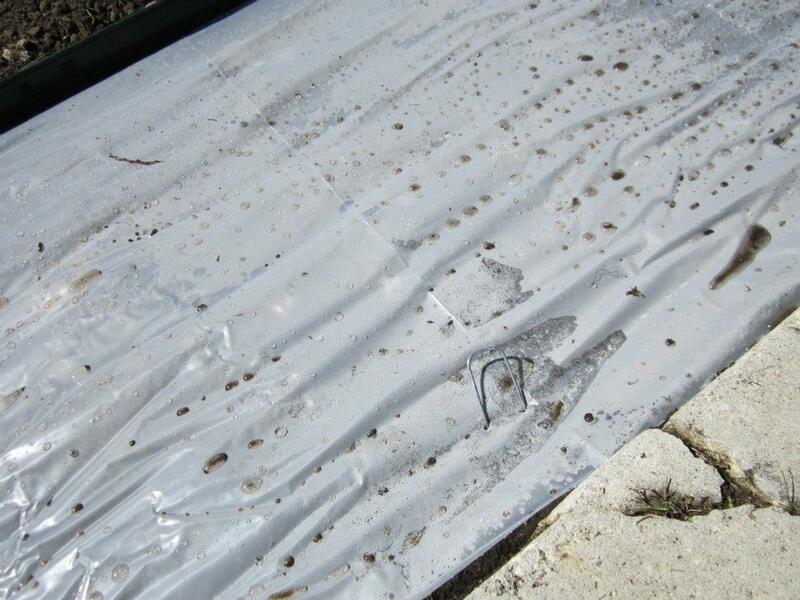 Lay the plastic from end to end over lapping at the seams after you have removed at least 2- 3″ depth of soil. Be careful NOT to run plastic up the sides of the edge because you want water to drain there. You will also find that by adding bulk rover rock that the sediment from the rock will fall to the bottom and create a layering affect. (smallest at the bottom and largest at the top). This is a landscape pin. You will use this to pin the plastic into the ground along the edges of the plastic. At this stage you can pierce the plastic with a pitchfork Watch for irrigation pipes) if you choose. I found this to be just as good a technique though it allows the nutgrass to take over pretty swiftly. Here is your finished product. 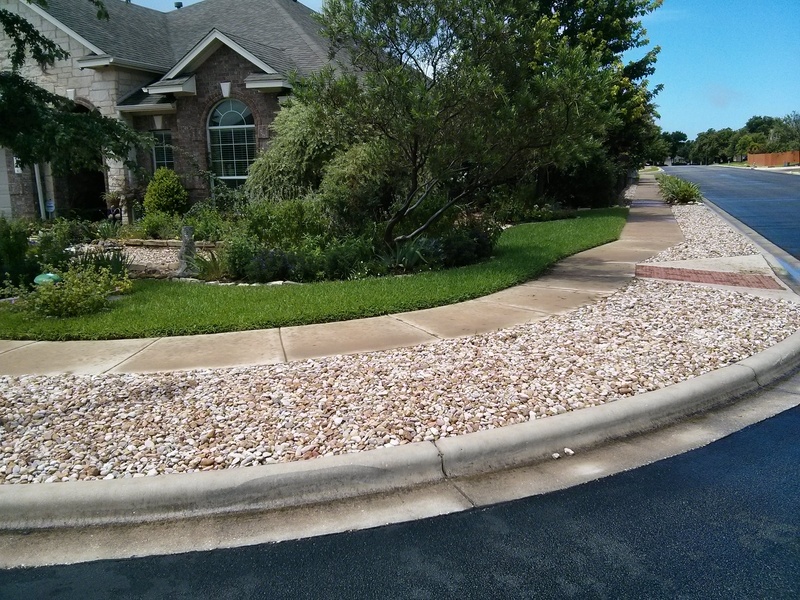 I recommend a 1-3″ river rock not a pea gravel. The smaller the rock the more fluid it will become and spill over and be difficult to walk on. 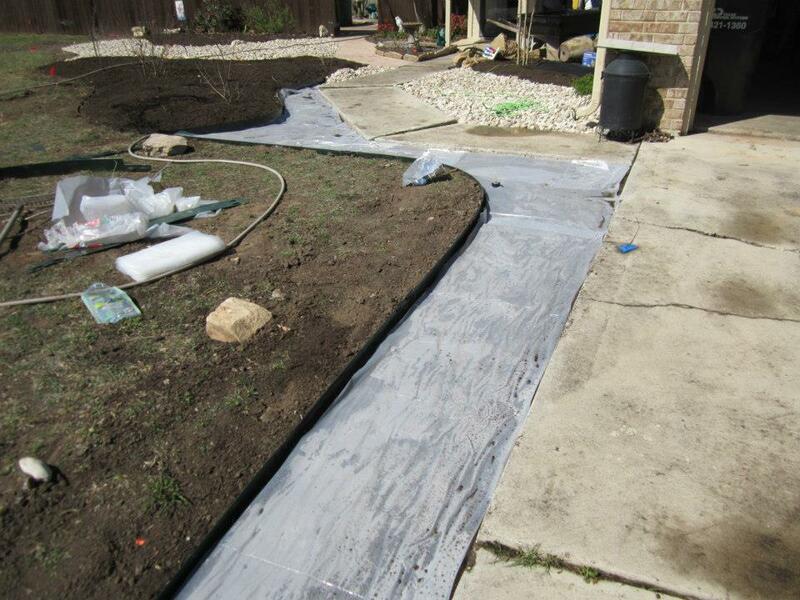 The plastic is only recommended for small areas of rock, not for mulched beds, graded slopes or hillsides. If you have Oaks be wary of placing rocks beneath the trees as Oak leaves do not break down quickly and you will have to blow or vacuum the leaves from the rocks to keep them looking neat. All in all I am a big fan of stone and I love to use hardscapes in my landscape designs, I also think there is a limit to how it should be used. 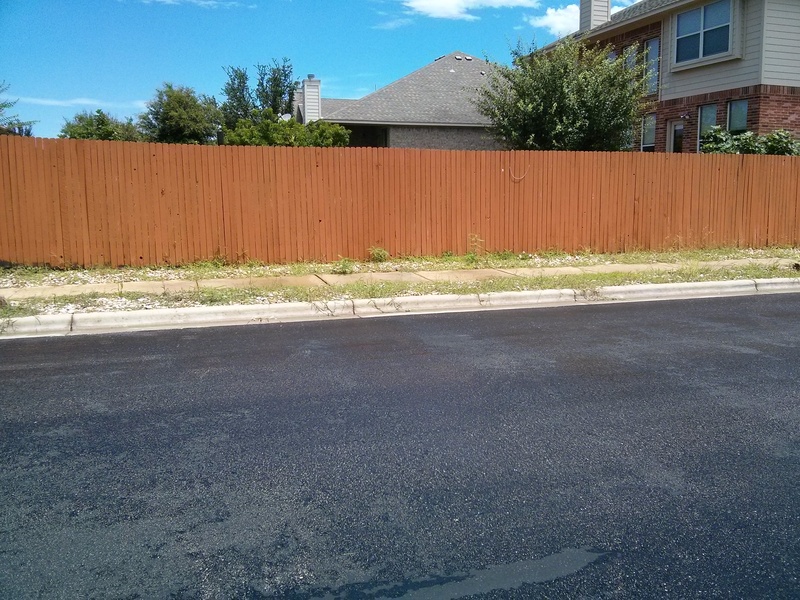 We are not trying to turn Austin into a desert but as an alternative to an empty mulched bed when plants are not desired. 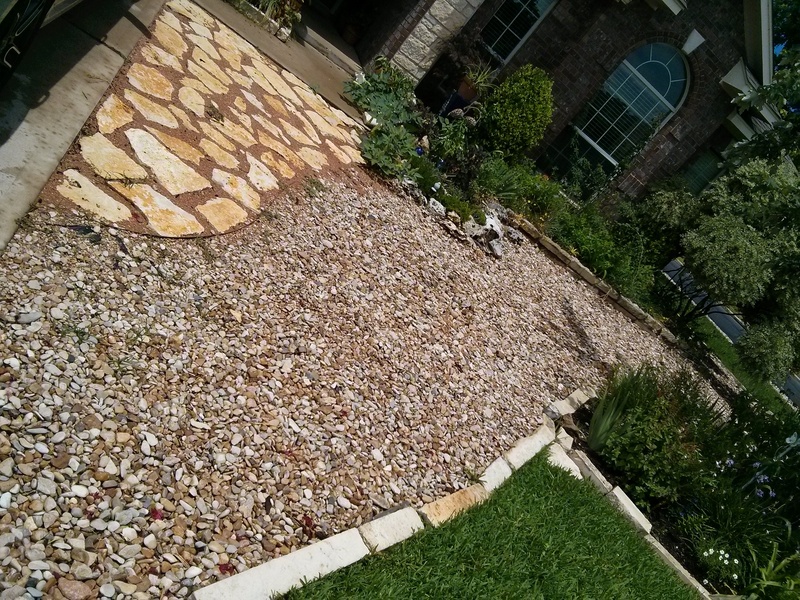 River rock and stone are a beautiful low maintenance, no water landscape solution if you know what you are in for. It is not a free ride to no maintenance town. Stunning when used correctly and the owner understands the maintenance that is expected. Remember too that rock adds heat. So be careful where you use it and be sure to use the appropriate size. Pea gravel is very fluid and aside from easily being kiccked about can also be difficult to walk on. 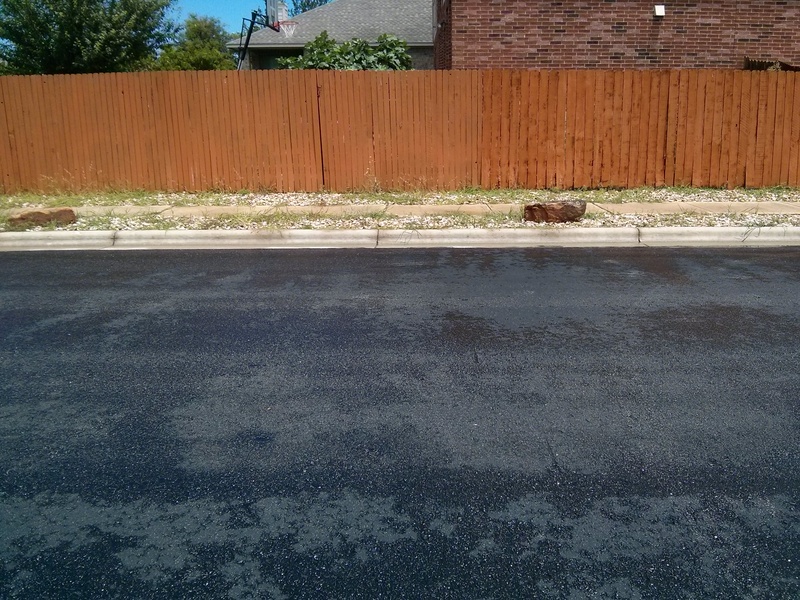 1.5 – 3″ is typically the best to use in a nuisance strip or walk way. Larger stones look great but can be difficult to walk on. If you are not willing to accept the amount of maintenance a river rock bed can be then leave your sod/weed strip and mow the weeds. 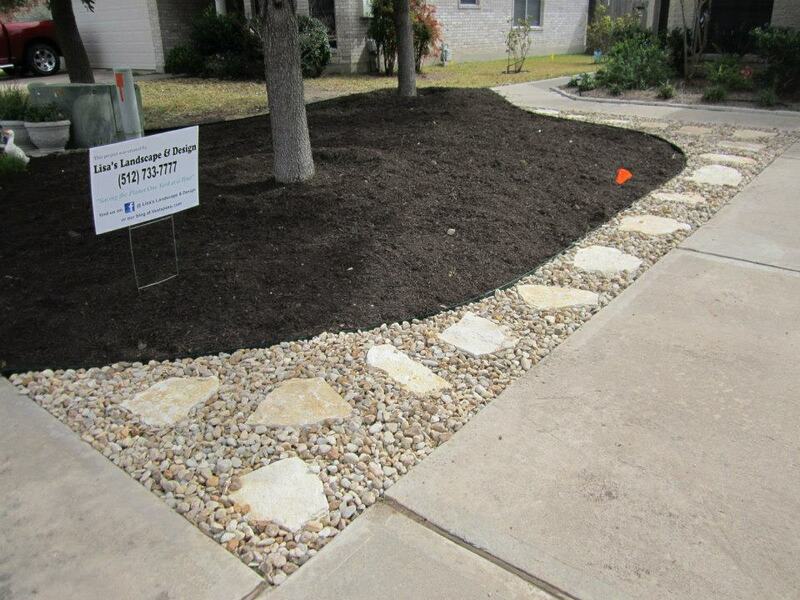 If you are looking to reduce your lawn, consider well mulched landscape beds with appropriate sized plants. If you choose to use rock in your landscape, understand and accept the maintenance and you will be saving water and saving yourself a lot of trouble in the end. Hi Rocio, you are correct, the plastic will kill the soil beneath and for a space like your “nuisance strip” that is not a problem. You would not want to use this method on a hillside, an area where small trees are growing or on land that is prone to bad drainage. It is a great method for weed control when used in moderation. Great comment! Great post. We put down rock over a French drain without plastic underneath, and then had to rake it all off the next year and redo it. Doesn’t drain as fast now (holes in the plastic over the French drain), but weeds are less of a problem. Good to know it is working for you. There are definitely some circumstances where plastic is not the answer, but when it is, it works great. Tops my list of the absolutely most helpful how-to gardening blog entries I’ve ever read. Thanks! Thanks Sandy! I appreciate the feedback. Hi Lisa, yeah the weeds are a drag, plus I have all the chinaberries on top of that! Regarding your weedkiller recipe, I assume that’s 1 whole gallon of 20% acidity vinegar? Also, wont it react violently when you mix baking soda with vinegar? Good post! My natural herbicide recipe is very similar to yours but I don’t use epsom salt, I use horticultural grade orange oil. My entire recipe for a small batch is 1/4 cup orange oil, 8 cu 20% vinegar, 1/2 tsp liquid soap. I’ve never used it on weeds but it works amazing on poison ivy. FYI the orange oil on its own is great for a lot of things including killing fire ants (and the grass around the fire ants, unfortunately) and cleaning floors. It is recommended to rinse your sprayer really well every time you use this stuff b/c the vinegar will break down the soft parts of the sprayer. I plan to put rock in some small spaces between my A/C condenser unit, rain barrels and exterior walls; it’s impossible to weed-whack those areas b/c they’re too narrow, and I hate seeing long grass growing there b/c I feel like it could be harboring nasty critters. I guess I will just have to be on the lookout for weeds! I found this post very informative- thanks for the info! Thanks Laura, I have not heard that recipe but will definitely check it out and I have certainly not heard of anything natural that kills poison ivy. Great information! Thank you for sharing. I will share that recipe on my Facebook page too! I have river rock on my front lawn at our coastal home. It is a larger size rock and is difficult to walk on. I would like to add a stepping stone walkway.. do I need to remove the rock or can I just lay the larger 2ft x 2 ft flagstones over it? Hi Pam,Yes,the rock is a great solution as long as you keep up with the weeds. I recommend an organic weed killer or a 20%acid vinegar solution mixed with 2 tablespoon epsom salt and 1 tbs dish soap. Do you see a problem with 4”to 6” cobble stone place around the bottom of a 30’oak tree in a 6′ ring to replace lawn??? Hi Steve, I would stay with 4 inch or smaller because Oaks do not like a lot of heavy weight on their roots. Also, make sure there is good filtration and as much of the root flair is exposed as is possible. This is one area I would recommend Landscape fabric as a weed barrier as long as the tree roots and flair are not covering the existing bark.